There is no such thing as traditional marketing funnels with Google Adwords PPC marketing. With traditional marketing, it is normal that prospects enter the funnel at the top, become aware but not engaged, and then progress over time, slowly getting to know the solutions to their problems. Adwords allows you to target your digital advertising for people who are ready right now. 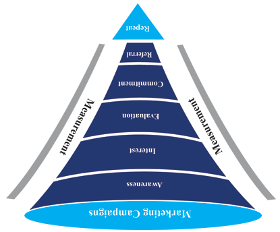 Yes – the sales funnel is upside down on purpose. Starting with awareness and ending up with a deal is the old way. Starting with your best prospects and working outwards is a new way, at least it is for us here in digital marketing land (Milton Keynes). These Searchers have intent, and when they are searching for specific locations, they’re ready to do business. Avoid spending money on advertising to people who are not ready yet – at least at the beginning when managing smaller budgets. Small budgets demand a quick response. Spending the marketing pot and waiting six months for deals is not acceptable. Overheads cost. Instead, turning the budget around quickly, spend, close, deliver and receive means that the same budget can be re-invested multiple times more per year. So, widening the search, so to speak, further up the funnel, can result in potentially less bang for your buck. Ultimately, you’ll want both, but when starting out, with a small marketing budget, make the most of opportunities that convert quickly, so you can re-invest the profits. In other words, the less you spend initially, the more likely you are to get good value. From our base in Milton Keynes, we provide Digital Search Marketing Services, Management, Advice and Software. We serve Professional Services Companies; Dentists, Solicitors, IT and Telecoms Solutions, High Value Consumer Goods Providers and Manufacturers, Locally, and Nationally.